The video was uploaded last week by YouTube user Sergey MoldovanAmerican, who stated that he spotted the Semi pair driving on a CA highway. 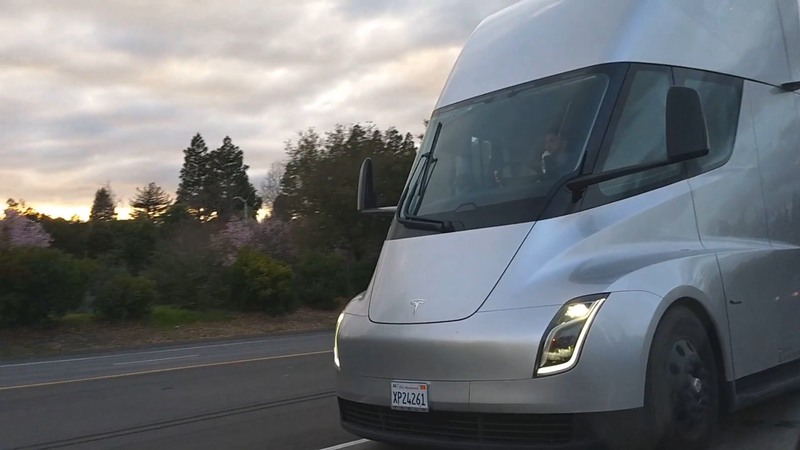 The nearly 1-minute sighting featured the two electric Semis up close, giving a pretty good idea of the massive size of the electric trucks. 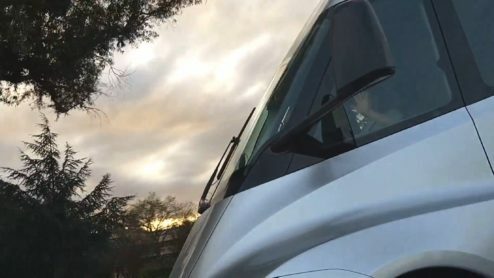 The driver of the long-range, silver Semi seemed very relaxed, drinking and even candidly waving at the camera as the YouTuber’s vehicle passed his truck. The 300-mile range, matte black Tesla Semi was just ahead of the silver Semi. 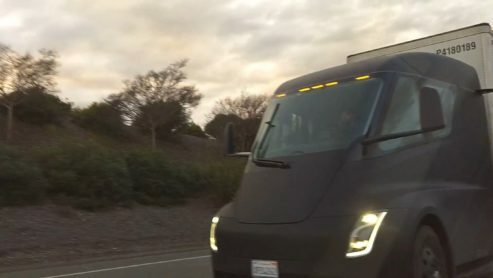 From what could be seen in the video, the black Semi was pulling the same container it was hauling when it was spotted at a Supercharger earlier in March. 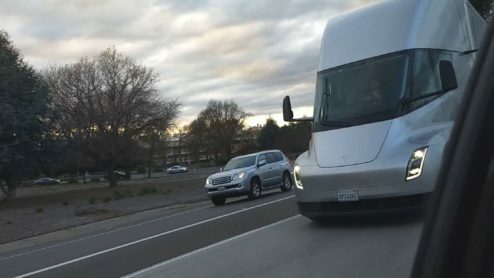 The sighting was location-tagged at Danville, CA, which is 30 mins away from the Fremont factory via I-680 S.
The formation of the two electric trucks are reminiscent of what Elon Musk described as the Tesla Semi’s capability to drive in “Convoy Mode.” This particular feature enables a fleet of Semis to semi-autonomously draft in close proximity with each other, reducing energy usage from wind resistance. “The convoy technology, the tracking technology, this is something that we are confident we can today do ten times safer than a human driver. I want to be clear, this is something we can do now,” Musk said during the unveiling. Sightings of the Tesla Semi over the past month have become more frequent, with Tesla fans spotting the electric long-hauler on various locations across the country. Not long after the Tesla Semi pair were spotted on the Rocklin Supercharger, the long-range, silver version of the truck was sighted at the Anheuser-Busch brewery in St. Louis, MO. Later during the same day, the long-range Semi was sighted parked at a Supercharger in St. Charles, which is about 24 miles away from Anheuser-Busch’s facility. A week after the MO sighting, the same Tesla Semi was spotted at the Dallas, TX Service Center, showing up a day later on a private demo event for PepsiCo employees at Reunion Tower. As we noted in a previous report, one of the r/TeslaMotors subreddit’s members, Ryan O’Donnell, was able to attend the private event. While in the demo, Ryan was able to speak with a PepsiCo employee, who noted that the company’s 100 orders of the Tesla Semi were just a “drop in the bucket” for PepsiCo’s overall plans. Just recently, we also reported on FedEx placing reservations for 20 Tesla Semis, which the courier delivery service will deploy for FedEx Freight, the company’s less-than-truckload (LTL) service. Overall, the Tesla Semi could very well disrupt the trucking industry the same way that the Model S disrupted the luxury sedan market. Equipped with four Model 3-derived electric motors, the Tesla Semi is capable of hauling 80,000 pounds of cargo, classifying it as a Class 8 vehicle. The instant torque provided by its multiple motors also enables it to go from 0-60 mph in just 20 seconds with a full load. Without any cargo, the Semi can hit 60 mph in as little as 5 seconds, which is close to muscle car territory. Watch the Tesla Semi pair’s relaxed drive in the video below.